Summer braise, makes me feel fine… – Eat, Drink, and Go! I usually braise or slow cook in the winter because I like the hearty, deep, rich braises and broths that warm your soul. Think tomato and good red wine, beef and Guinness, spicy BBQ and bourbon. Mmm. But alas, it’s summer! What to do? I felt like braising some chicken thighs, but it was nearly 90 degrees out yesterday. Think. Quick fridge scan. I had chicken, chicken broth, and white wine, as well as some shiitake mushrooms, carrots, and even had some quinoa in the pantry. I love it when a plan comes together. Summer braise! I seared the thighs in EVOO with a dry rub of some paprika, brown sugar, salt and pepper in a hot pot (got it good and hot before the sear, of course). Removed the chicken from the pot and then used its juices mixed with the olive oil to sauté carrots and red pepper. If I had an onion or shallots, I would have used that too, but last night, I had not. I added the chicken back into the pot and built the braise. Chicken stock, white wine, and some herbs de Provence. Season to taste with salt and pepper. Braised for about and hour and a half, and then added the shiitake mushrooms (hint – don’t add mushrooms to liquidy stuff too early because they are lushes and drink too much). I did the quinoa separately most of the way in a separate pot, but finished it in the braise to soak the extra liquid up at the last minute. 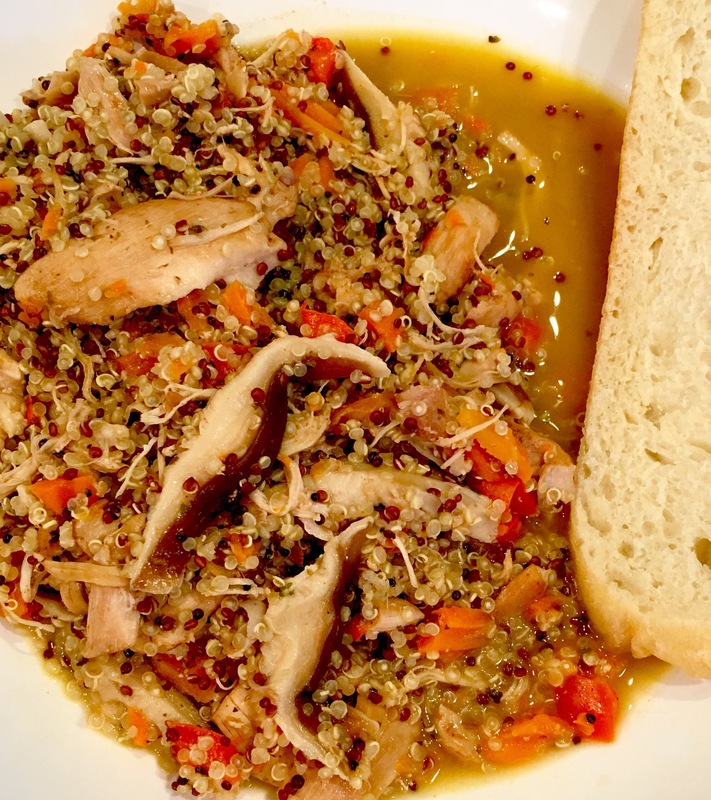 Sidebar – quinoa is the new cous cous and is a great “whole grain” kinda thing if you’re into that. I am and I love quinoa, it’s soft and crunchy at the same time! The dish ran the final lap together in beautiful, synchronized strides. The braise and the quinoa, neck and neck to the finish line! It came out sooooooo good!!! Added a slice of that Tuscan bread from the other night to sop up the extra liquid. Had I not the bread, I certainly would have licked the bowl. There is no shame in that! Paired with a nice imperial porter from Jailbreak brewery called Dusk til Dawn. White wine would have been too predictable. Plus I had used the last of my open bottle of white in the braise! !